Oppressive, battleship grey clouds ponderously plodded over the cheerless, cold morning that dawned in Dunedin on Wednesday, 13th August. Like the weather, the Lodge’s news for the day was grim. One-by-one the members learned that a great friend and stalwart of Lodge St. Patrick had passed away in his sleep. Even the previous night, Rt.W.Bro. Gordon Baines had been at the tiller, steering a positive course for the Order he was delighted to serve. He looked a little tired that evening, nevertheless, as for so many before, he had tended to a Lodge of Instruction and shepherded his sometimes wayward flock through a rehearsal of a Master Mason’s Degree. A suggestion here, a correction there, all added to his continuing efforts to make the Lodge’s ritual work as perfect as possible. It had gone well. He himself was a ritualist of consummate skill, so when he spoke, Brethren listened. The practise night was attended by a band of usual suspects and so, for them, next day’s most unexpected news was perhaps more shocking than for some others. What can one say except, “you don’t.” One simply has to suffer fickle fate as she is and accept that your days, for some long time to come, will contain an empty hole where once there had stood a man upon which one could rely – and totally. One can only celebrate the life of such a man; for what he has done for his own family, his community, your own Lodge, and perhaps even for oneself. James Gordon Baines had done much. He was born in Preston, north Lancashire in England on 24 October 1928, just one year prior to the Wall Street Crash that sent the Western industrialised world into the downward spiral of a 10 year economic depression. The period also signalled the sinister build up to the start of a second world war. The Baines family decided to move to New Zealand before the outbreak of war, and they settled in Brighton, Otago, where Gordon’s father ran Baines Brothers’ grocery shop. As a young man Gordon trained as an accountant and, following a spell with the Inland Revenue in Dunedin, in 1960 he joined the Finance Department in the family firm of Harraway and Sons, one of the South Island’s premier cereal manufacturers. He had loved Jeanette since the day he had met her and, five days after her 21st birthday, they married. She was his sun and his moon, and he doted on her until, following a long illness, she died. Her death to him was crushing and, even to his last day within touching distance at his home, was visible to any visitor, her smiling photograph. Jeanette was a very creative individual. She taught cake decoration and was an accomplished needlewoman. In this area, no doubt through some sort of Lodge subterfuge, she was frequently “talked into” embroidering new aprons for new Masons. It seemed to her that there appeared to be a never-ending flow of these! Bro. Baines was a long-time in the English Constitution. In 1968 he was initiated into The Lodge of Otago No. 844 E.C., the most long-established Lodge in Dunedin and, from early on, his competence was evident. He became Master of 844 in 1974 and was steadily promoted eventually attaining the high rank of District Grand Master (1990-1992). Gordon Baines had a reputation for easy and close co-operation with the other constitutions and was highly respected everywhere as a result. He was an honorary member of Dunedin Lodge 931 E.C. and of Port Chalmers Marine Lodge 942 E.C. (See story elsewhere on this site.) In 2005 Port Chalmers was the last remaining Lodge in the English Constitution in Dunedin but sadly after 140 years it had to close, whereupon several of its experienced Brethren, including Gordon, then affiliated to Lodge St. Patrick where their zeal for the Craft greatly enhanced this Lodge’s membership. Indeed, for his work within Irish Freemasonry, Gordon recently had had conferred on him, by the Grand Lodge of Ireland in Dublin, the award of Honorary Provincial Grand Chaplain in the Irish Constitution. Amusingly, as this rank carries the title of “Very Worshipful Brother” and as Gordon was already a “Right Worshipful”, there was some confusion at the ceremony as to whether he should now be addressed as Right Very Worshipful, or Very Right Worshipful Brother! Gordon was also in the Rose Croix (a higher branch of Freemasonry) and this Order he very much enjoyed. He had been initiated into the Dunedin Chapter, number 317, Rose Croix on 7 April 1975, becoming its MWS in 1984, and he didn’t let the grass grow under his feet. On 20 May 1988, he was raised to the 30th Degree and was holder of the 32nd Degree at the time of his death. Few Freemasons ever see that number on their collar! For a quarter of a century he served the Dunedin Chapter as their Director of Ceremonies and in this role and later, with his deep knowledge of ritual, he was a tower of strength. Gordon was also a frequent visitor to the home of his very close friend, the late W.Bro. E. W. Gifford Brown JP, in whose company for decades he was often seen on fraternal visits to Masonic Lodges far and wide. A confirmed Baptist, Gordon felt pressured to change congregations when his first church, Sunshine Baptist Church became fervently anti-Freemasonry. It was a period of his life that greatly that distressed him, but his next choice of congregation, Dunedin City Baptist Church, proved to be a much less narrow minded lot - thankfully. It was important when, during the funeral, his son Peter explained to the large number of mourners in attendance that his father, though a very religious man all through his life, had NEVER found any incompatibility with his belief in God and his membership of any Masonic Order. Freemasonry being a fraternal organisation NOT a religious one! Gordon was once described as being ‘quite reserved’. Certainly he could be a determined character and liked things to be ‘just so’. Being from the old school, at Lodge meetings he liked Brethren to be well-practised in their ritual work, but for some people unaccustomed to working with words, ritual can be difficult to learn and perform, so for them he would always be ready to make allowances and offer encouragement - as long as they at least tried. To those who took the time to get to know him, in reality he was the quintessential gentleman, polite and gracious to all, yet he had his opinions and was forthright when he felt it necessary. In private, however, this interesting man really relished practical jokes, toilet humour and horsing around – especially with his three sons. 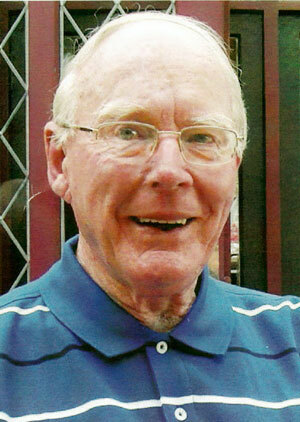 Gordon had through his life suffered from poor eyesight, however, just a few weeks prior to his death, he had undergone cataract operations on both eyes. As far as he was concerned both operations had been a great success and he said that his sight had never been clearer - ever. What a pity it was that he couldn’t have enjoyed this new gift of sight for just a little while longer. 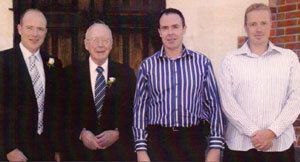 Gordon poses proudly with his three sons, Andrew, Peter and David.